In early 2007 I acquired a brand new Fender FB-59. I had been looking for some time for an instrument that I would feel OK taking to parties, playing in bars and generally be a banjo which could be easily replaced if it were damaged/lost/stolen. I had been hoping to find a '70s era Ibanez, an instrument which would have filled that slot nicely. Good sound, well made and replaceable. Well I guess the old Ibanez banjos are more sought after than I had thought, because after 6 months I had still not found one. A chance visit to my friend Alistair Cuthill's music store in Wellington put an end to the quest. He had 2 FB-58s and an FB-59 in stock. I had great fun tuning/picking the 3 of them and spent a really pleasant morning in his store. After a 24 hour cooling off period, I called Alistair to let him know I wanted the FB-59. When it arrived the first thing I did was to replace the bridge with one of Scott Zimmerman's Z bridges, and next change the strings. During the string changing I decided that I really hated clam-shell tailpieces and fired off an order to First Quality music for a Kerschner. Following the string change, out came the drum-key and I played with various levels of head tension until I got the banjo to sound like a banjo. Overall I am pleased with the instrument. It sounds like a banjo, is reliable and is nicely finished. After 18 months the gold has mostly worn off the arm-rest, but I can't say I was really surprised by that. In all, it more than meets my need for a reasonably priced instrument. The thing I like most about the banjo. is the profile of the neck. It seems to me to have just the same feel as the Fender Artist I had 25 years ago (and foolishly parted company with). The fingerboard is slightly wider than a standard Gibson and the neck is thinner through its profile. Having played that old Artist model for so many years, it felt like a home-coming to once more play a Fender, albeit an Asian replica. 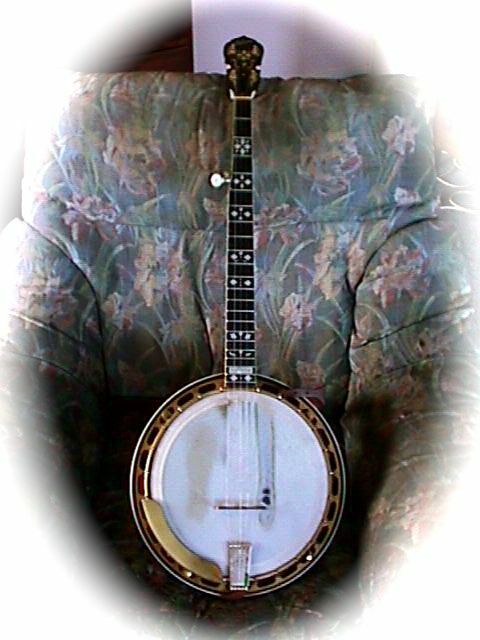 Since acquiring this banjo in June 2010 from Larry Perkins, it has become my main instrument. It is the most reliable banjo I have ever owned. It stays in tune (well a banjo is never quite in tune but you know what I mean) and is always just ready to be picked. You can see from the wear on the head just how much use I have had from it. Also, the nickel plate on the arm-rest has taken a bit of a beating, but these things are to be expected with an instrument that is frequently used. 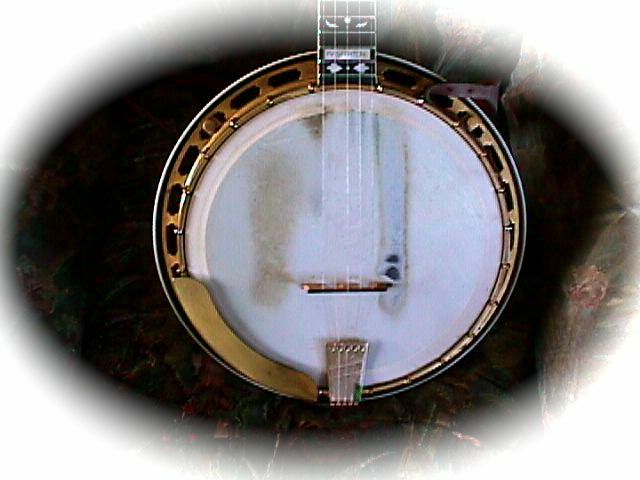 The tone is great - a nice even response all the way to top C and it thumps out the lower tones as well as any banjo I have played. 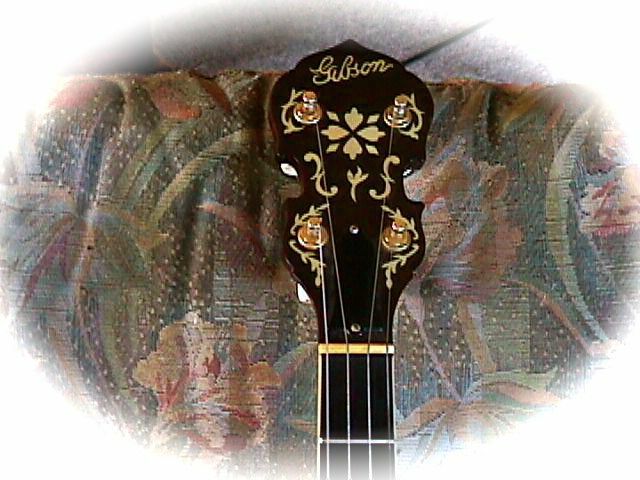 It does not have the subtlty of a pre-war Gibson (see below) but it is also not prone to changing its tone completely from one day to the next. I have used it in several recording sessions and am very happy with the results. For live performance it is just great. I would not hesitate to recommend Recording King banjos for anyone (beginner to advanced) who is looking for a good reliable, playable instrument. 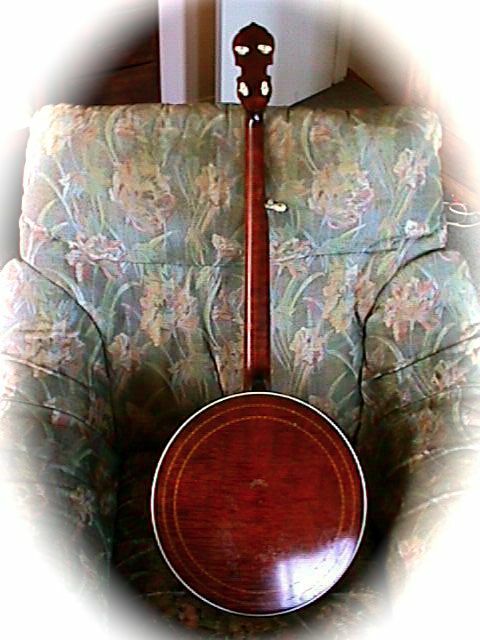 In 1983 I was fortunate enough to acquire a 1929 Gibson Granada archtop tenor banjo. It came to me in its original case fitted with 3 rusty strings, a motley collection of tuners (none of which were original to the banjo), a non-descript cheap japanese tailpiece and a rather worn Rogers vellum. I briefly had one of those "OMG - all that money for this!!!" moments and then set about organising a small amount of refurbishment to restore it to playing condition. I took the whole kit and caboodle up to Chris Warner in Hanover, Pa and had him make a 5-string neck and do a proper setup on the banjo. After waiting for what seemed forever, (in reality less than a month) I journied back up to Hanover from my home in Arlington, Va and proudly took delivery of an instrument that has been with me ever since. 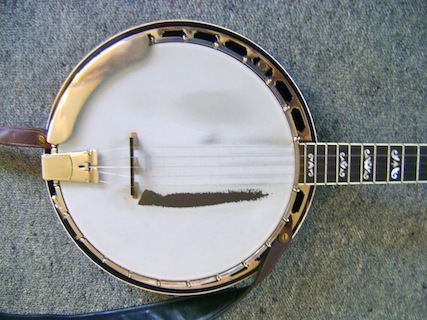 I just could not believe the transformation from the horrible horrible  sounds that it made when I tried to play it in its original state, to a banjo with a sound that can only be described as "pre-war". The banjo has served me in good stead since then. I have come to accept that as it approaches its 80th year, it is getting a little creaky and temperamental. Some days it will just not go into tune. Other days it seems to think that it would be a real good idea to start generating wolf-tones every time I hit the 5th string. I have learned to live with these vagaries but when things get untenable, I send it off down to my good friend and luthier, Keith MacMillan, to have him work his setup magic on it. I used the Gibson for recording all the songs on Beyond Dark Hollow and I hope I have been able to capture the wonderful dynamic range and nuances of tone that these old instruments can produce. I still have the original tenor neck and bracket hooks from the banjo. The bracket hooks are not really useable, about half of them being very close to breaking. I replaced them all about 5 years ago with a set I acquired from Janet Davis Music. 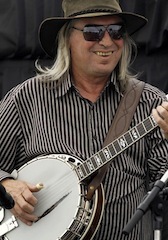 The Kerschner tailpiece and planet tuners are parts that Chris Warner fitted to the banjo back in 1983. If the current prices for genuine pre-war parts weren't so ridiculous, I would replace them with the real thing (assuming they could be found) but I am very happy with the look, sound and useability of the parts currently fitted. These parts will of course one day be antiques in their own right. There are more detailed photos here. The banjo is now fitted with a Sullivan conversion flat-head tone ring.